In the past year or so, there has been a major health food trend centered on non-GMO, organic, substance-free foods all over the place. Why the big shift from “quick” and “easy” meals? Humans couldn’t handle it anymore! The toxins and hormones in our food were literally killing us. Diseases and imbalances like fibromyalgia, depression, cancer of all types, irritable bowel syndrome, and immune disorders were soaring so high that suddenly nobody cared about inflation as much. This is the reason why the most sensible sections of our population began caring more and actively seeking healthier solutions to their dietary needs. Name brands and health care providers soon returned to the roots of our existence -Mother Nature. You’re reading this, so you might feel the same way too. If you are seeking the cure to the “incurable” fibromyalgia, depression, cancer, irritable bowel syndrome, and such, why not turn your attention to Naturopathy? The holistic alternative methods used are backed by science and years of study and good results. Our large list of alternative medicine reviews on TripAdvisor and Facebook can paint the bright picture you’re desperately seeking for. 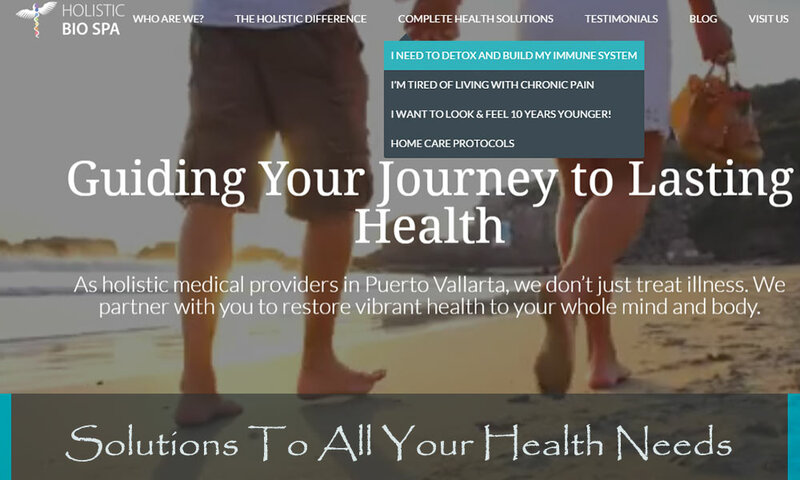 After you read from others with similar problems and learn how they benefited from natural alternative medicine in Puerto Vallarta, check our recent posts for “baby steps” in the right direction. We listed some serious illnesses above. The best option for you is to allow your body to heal itself while getting the natural assistance you need to promote such a healing. Basically, you need to put a halt to breaking down your body while giving it the boost and guidance it needs to recover from the years of inflicted damage. What is that all about? It’s a vacation to our beautiful Puerto Vallarta + the natural holistic medicine provided at Holistic Bio Spa. You pick which services you would like and how long you want to stay, we’ll help you accommodate your travel itinerary while you just relax and let your body heal. Look on our website under COMPLETE HEALTH SOLUTIONS to see our recommended healing packages. Go to TRAVEL AND RECOMMENDATIONS to see how enjoyable your special “healing + me time” can prove to be! What do you think: Can you go on another 2 years with your current state of health, or do you need to care for yourself before it’s too late? Let us know in the comments, we’ll be glad to guide you in the right direction!